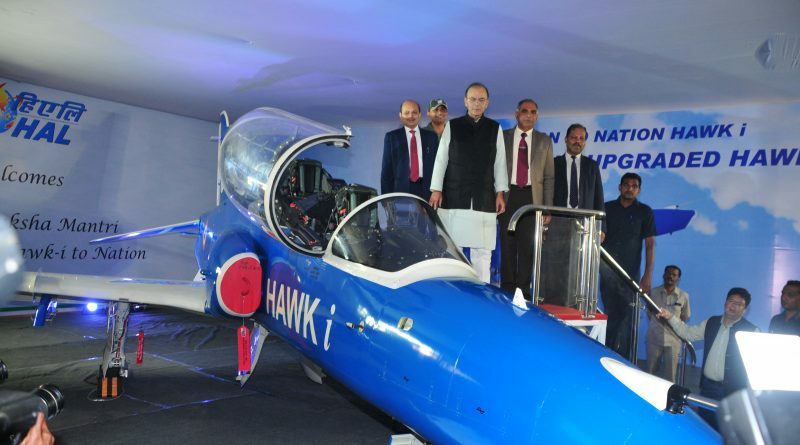 Bengaluru: Union minister Arun Jaitley dedicated the Hindustan Aeronautics Limited (HAL) upgraded Hawk-i jet trainer to the country and inaugurated the 5.8 tonne Light Combat Helicopter (LCH) production line. The minister addressed high ranking officials and employees from HAL, Bharat Electronics Limited (BEL) and Bharat Earth Movers Limited (BEML) at the event. He said India was in a sensitive geo-political situation and it was imperative not to compromise defence preparedness. “It is extremely necessary that we came out of this mindset that India will always be a buyer of defence equipment. Our narrow policies in the past have contributed to this. A change was long overdue,” he reiterated. He added further that a combination of Defence Public Sector Undertakings (DPSUs)’s dedication and private sector’s entrepreneurship was needed to overcome this, and the government was making policies to facilitate it. Ashok Kumar Gupta, secretary (Defence Production), outlined the contributions made by DPSUs. T. Suvarna Raju, CMD, HAL, in his welcome address said maintaining its excellent track record HAL today has come-up with two new products that would strengthen India’s defence services. 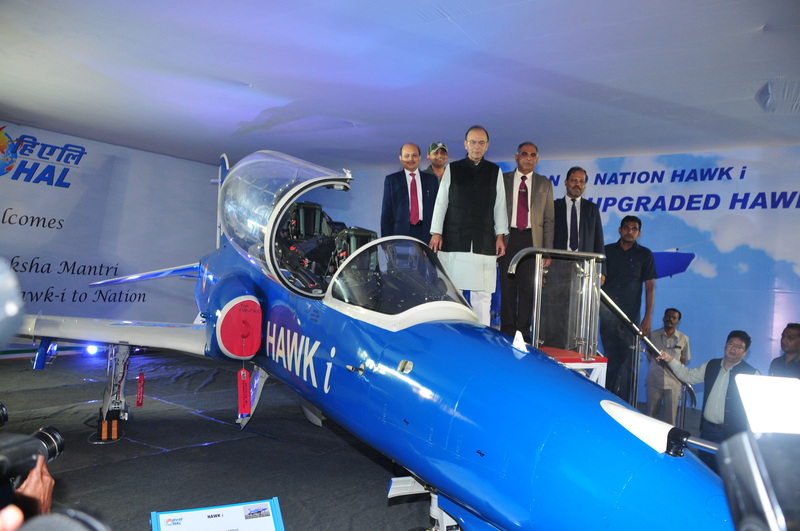 HAL officials said the Mission and Combat System R&D Centre (MCSRDC) took up the indigenous role change development programme to convert the Hawk 132 jet trainer into a combat-ready platform. The aircraft is upgraded with indigenously designed avionics hardware, software and system architecture enhancing operational role from a trainer aircraft into a Combat-ready platform with improved quality and depth of training by Large Force Engagement (LFE) tactics through Electronic Virtual Training System (EVTS). Hawk-i is capable of delivering precision Munitions including Air to Ground and close combat weapons, self defence capabilities through Electronic Warfare (EW) systems, digital map generator and operational reliability through new Dual Hot stand-by Mission Computer Avionics architecture supported by indigenous high accuracy and high-altitude Radio Altimeter, IFF MKXII, Data Transfer system, CMDS and RWR. The aircraft was flown during 2017 Aero India at Bengaluru with lot of appreciation from users. The integration of indigenous HUD, RLG based INS and Anti Airfield Missile is in advance stage. The indigenous avionics would enable better autonomy in integrating weapons and assist in obsolescence management of the avionics and software. Flight clearance of the avionics has been completed after 26 flights and HAL is targeting flight clearance for the complete aircraft early next year before offering it to the Indian Air Force (IAF). The event marks the commencement of the Limited Series Production (LSP) of the Rotary Wing R&D Centre designed LCH. The Defence Acquisition Council (DAC) had earlier cleared the acquisition of 15 aircraft for the IAF and the Indian Army under the IDDM category. The DAC clearance came after Centre for Military Airworthiness and Certification (CEMILAC) certified the LCH with the existing stores. HAL officials said its twin engine LCH of 5.8 tonne class featuring narrow fuselage and tandem configuration for pilot and co-pilot/weapon system operator, and the helicopter has indigenous state-of-the-art technologies like integrated dynamic system, bearing less Tail Rotor, anti-resonance vibration isolation system, crash worthy landing gear, smart glass cockpit, hinge less main rotor, Armour Protection and stealth features from visual, aural, radar and IR signatures. The helicopter is equipped with 20mm Nexter turret gun, 70 mm Rocket, Mistral Air to Air Missile, Stabilised gimbal EO-pod and Helmet pointing system, and can carry out operational roles under extreme weather conditions at different altitudes, hot weather desert, cold weather and Himalayan altitudes. The LCH has demonstrated capability to land and lift off from Siachen Range with considerable load, fuel and weapons.